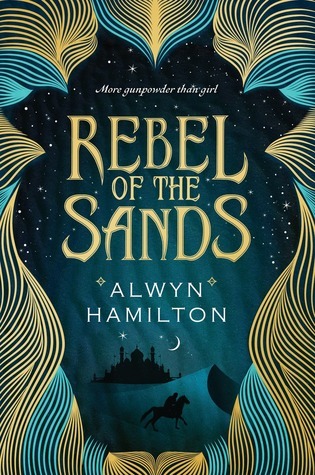 If you're a fan of deserty fairy tales like 1001 Nights, you'll enjoy this book. If you're a fan of the TV show Firefly, you'll enjoy this book. If you're a fan of both, you'll love this book. The story starts out more like a Western, with Amani being the best gunslinger in the two-bit town full of no-good people. Orphaned Amani is stuck with her horrid aunt and uncle, who want to marry her off. She sees her future set out before her and it is bleak. So she runs off with Jin, a strange newcomer. First intending to take advantage of him, but they slowly form a friendship which leads to something more. After awhile, fantasy creeps in with the introduction of the djinn - magical desert creatures. As well as certain people who are imbued with powers. You also get a touch of politics (which I always enjoy). A prince in hiding, denied his thrown. Another royal out to get Amani. It's dramatic and fun. The only thing that really bothered me about this book was it tried to hard - at the beginning - to sound like a western. The patterns of speech, in particular. More than anything it reminded me of the way Mal speaks in Firefly. It felt derivative. As the book went on, that type of speech decreased. I had a great time reading this book. Much more than I thought I was going to. I assumed it would be like the other 100 middle-east desert fantasy books I've read lately. It shares some tropes, but stands out on its own. The only problem is that as soon as I finished it, I forgot all about it. I even forgot to add it to my Goodreads list for a few weeks. Once I purposely stopped to think about it, I remembered how much I liked it - but unfortunately, it is not inherently memorable. Recommendation: Borrow because it's good but it's not as good as others of its ilk. I keep debating about picking this one up. A lot of people mentioned that it was a bit slow paced. Did you have that issue?